Open any fashion magazine and you’ll see them: models. Those beautiful glamazons who play a beguiling role in the shaping of our wants, desires and aspirations. In our quest for magnificent purses, perfect glossy hair or hot cars; for leaner bodies, cooler friends and a better life. The marketing and consumer goods industries have become masters at selling us by crafting a very specific visual culture built around particular tropes of beauty and their presentation. What is it about these models that leaves us wanting more? They are inordinately tall, impossibly thin. They hardly ever smile and have an air of practiced disdain. They simultaneously embody self-confidence and brittleness. They are no one in particular, yet transfigure somehow into the person we may want to be, or be with. The magic and mechanics of this transformation fascinate artist Theresa Pfarr, whose portraits of women are the focus of the new exhibition, The Look and the Longing, at Modern Arts Midtown through March 25. Her approach involves manipulating tear sheets and other collected images to build collages, from which her paintings are then composed. This method of decomposition and reinvention allows her to process ideas pertaining to identity creation. A trio of paintings from this prior effort are part of this show as well, setting the stage for Pfarr’s current explorations. “Oh Chloe, xoxo” from 2008 is a loosely rendered painting that teeters between realism and abstraction. The female image squarely at its center is discernable primarily by her carefully rendered neck, up-tilted chin and parted lips—a revealing glimpse of postural attitude. Her disproportionately long arms and empire-waist dress are nearly massless, neither disrupting nor melting into the rich and vibrant background. By contrast, “Mad About You” from 2011 aims to portray more about the sitter’s identity while maintaining Pfarr’s characteristic painterliness. Posed against a dark background, a young woman wearing a pink gown, low-cut in the back, turns her face ¾ to the viewer. The conventions of such a shot are all present—a direct but mute stare, parted lips betraying no emotion. Yet her features are widened and flattened, resulting in an exceptionally sad image—there is no hint of that aspirational inner life. One wonders in Pfarr’s work, has the relentless media culture robbed visual art of the potential to represent an individual through portraiture? Pfarr’s more recent paintings have become increasingly tighter, her focus on attitude more pronounced. Consider “Chimera,” a large square canvas featuring a seated woman in a short red slip. The upright part of her body, from head to hip, forms a vertical column filling the entire left quadrant of the painting. The attenuated gestures made by the upside-down V of her endless bare legs energize the remainder of the composition. The exaggeration of body and implied comforts of the setting convey Pfarr’s source material, while at the same time evoking the color, sinuousness and decorative settings of early 20th-century French painter Henri Matisse. The connection to Matisse’s bright and easy style evoking calm, luxury and sensuality is even more pronounced in works such as “Ringer” and “Untitled (pink chair study)”. In the former, a woman in a lavender slip dress is draped across a gilt-framed settee against a background of ornately patterned wallpaper. However, her look is confrontational, accentuated by her focus-pulling hand-on-hip pose, as somehow if her privacy has been invaded. 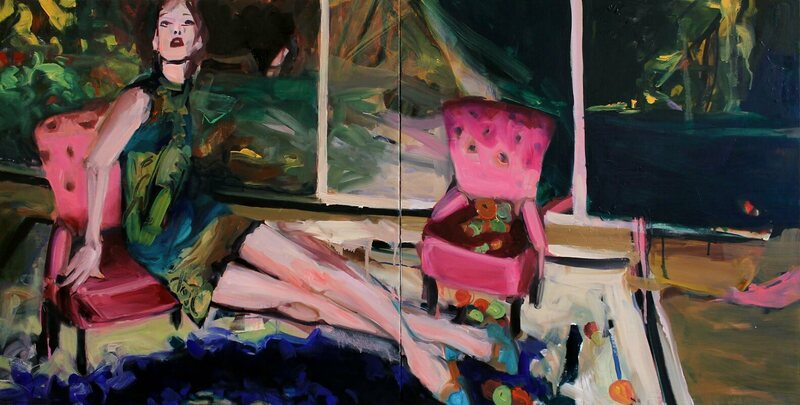 In the horizontal diptych “Pink Chair Study,” the viewer is instead invited into the model’s Town and Country world of sensual and creature comforts by the insinuation of the vacant chair next to her. At the same time, her anxious pose, nearly sliding off her tenuous perch, head tilted up as if reaching for air, is startling and unnerving. “Be careful what you wish for,” Pfarr seems to suggest. The show is also punctuated by several smaller canvases featuring “head shots” of women silhouetted against rich, dark backgrounds. A brilliant mix of reds, oranges and pinks, the fiery mane of the woman in “Red” provides the only keys to the personality of a visage otherwise closed off from empathy: through her slitted eyes, the model seems to look just past or right through us. Conversely, the subject of “Camo” stares confrontationally at the viewer. Pfarr’s careful distortions that break the lit and unlit portions of the model’s face into two distinctly different portraits has a disruptive effect which, coupled with the broad paint application, results in an image that is simultaneously compelling and disturbing. For an artist working in the realm of portraiture, there is always a dance between replicating surface and representing essence. Pfarr’s affecting work takes this a step further, probing the iconography of style-making and conventions of beauty to wonder how to confront and overcome the anxiety of a culture increasingly attuned to fashionable ideals. Theresa Pfarr: The Look and the Longing continues at Modern Arts Midtown through March 25. The gallery at 3615 Dodge Street is open Tuesday-Saturday from 11am-6pm. For more information, visit modernartsmidtown.